Early Spring unleashes the melt waters of the Australian Alps. The best adventures start with a tower. We are a bit short on towers in Australia, so we will have to make do with the ruins of the old flour windmill at the lonely town of Nimmitabel. 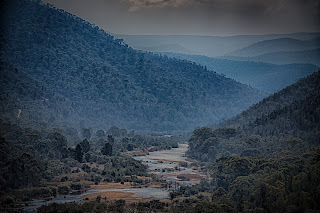 The town is on the edge of an alpine desert, but within coo-ee of the eastern rainforests, the high forests, the supposed resting place of the bushranger the Long Tailor and the cascades of the Snowy River. Nimmitabel is a gem - full of surprises (like the elephant next to the pie shop - and the pies are pretty good too). 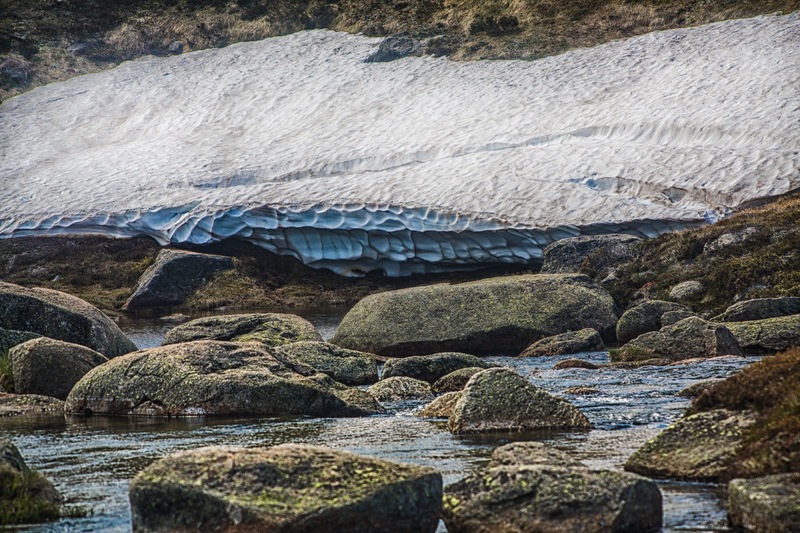 During Australian winters, Spencers Creek can be hidden under many meters of snow. 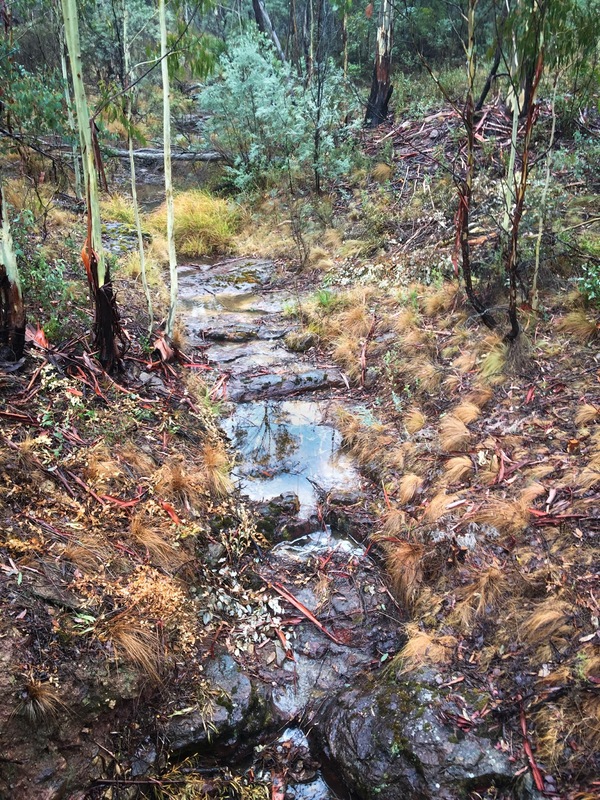 In early summer, snow banks still line the creek, one of the highest in mainland Australia. Some think that a glacier once cut this environment. 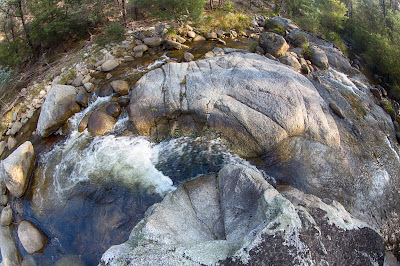 Today, snow melt feeds the cascades and waterfalls along the creek, which can dry into a string of waterholes in summer's heat. Snowfall in Australia has been measured here since 1954. In that year the maximum snow depth was 100cm and it took 2 days on a sled to get to the creek. It is an unlikely front line in the climate wars, but arguments rage over what the snow depth reading mean. As the snow melts in the last days of spring, the waterfalls of the Australian Alps have come to life - from the icy cascades of Piper's Creek to the 460m (1,500') Tin Mine Fall (no one can be sure of its exact height, it is said to be too remote). In late spring the snow has largely gone, and you can adjust to walking on the soft spongy ground of the alpine meadows. 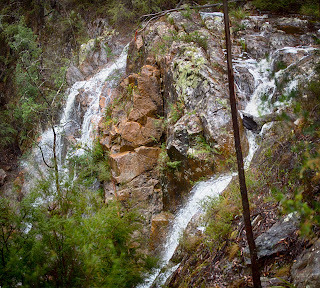 This is a multi-step fall on Sawpit Creek near the road to Smiggins Holes. The creek is full of cascades and falls, but most are obscured by dense bush and rock features. This fall is found in a brisk 3 hour hike up the creek's gorge. 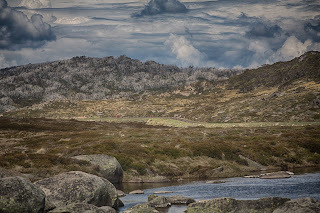 Today, the bush was alive with alpine wildflowers and birds. 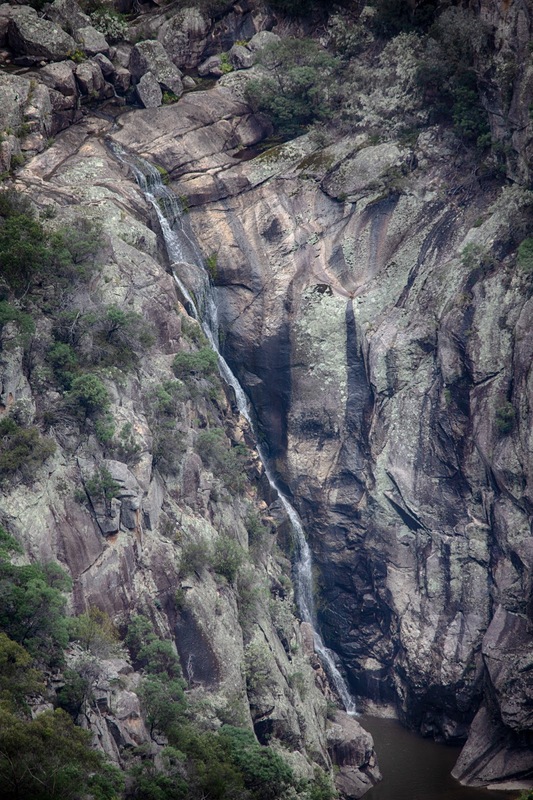 At the base of the fall, i met a black wallaby and we both came close to falling in. I saw no one else walking on the track. Down Dalgety way is a bit desperate in dry years but when the snow starts to melt, the Snowy is going to be running hard very soon. 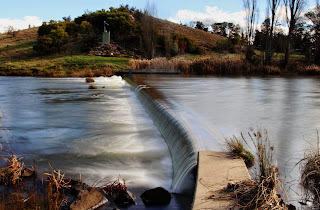 About 200 years ago, at the time of white settlement, the Snowy River in South East Australia was a fierce torrent. High and unpredictable, it was a tangible barrier to exploration and trade. The river could only be crossed reliably at a couple of points – and these places became small towns. I had been searching for one of these crossings, in many western districts referred to as falls. 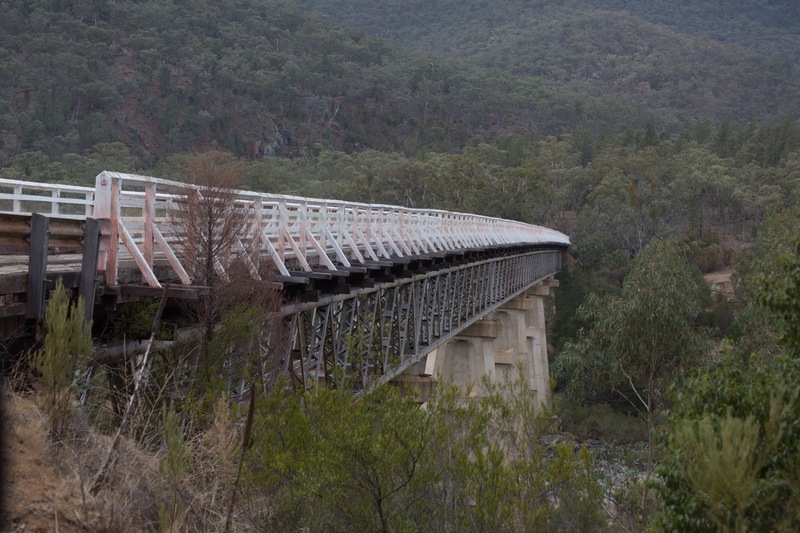 In a coronial inquest from the time, the place I was searching for was called Buckleys Crossing. 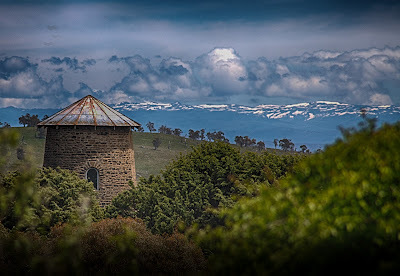 A couple of years ago, while filming a history of the coronial, I came across it by accident. 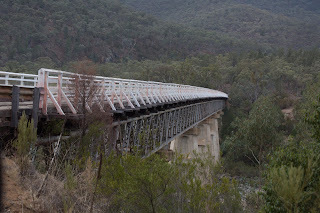 Crossing the Snowy River at the town of Delegate I found the Buckley’s Crossing Hotel on the side of the river. 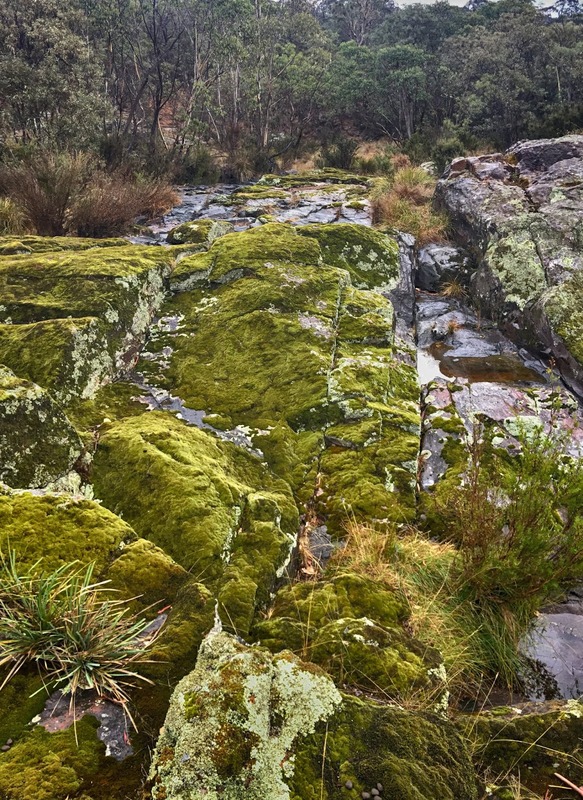 Scratching the surface, I found that the Buckley brothers had used an old first people crossing to establish a route into northern Victoria in 1839 using the crossing at this point, and that it was used as the launch point for cattle drives into that part of the country. 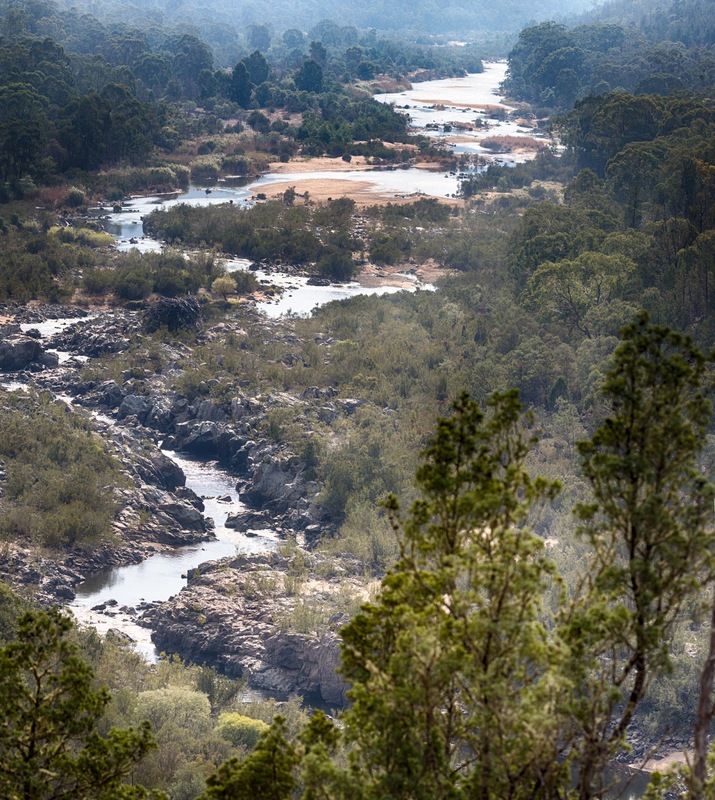 When Australia embraced the hydro-electricity after the Second World War, water from the Snowy River was diverted from the coast into inland rivers. The Snowy River was reduced to a barren rocky creek, and its surrounds dried out and died. At the coast, salt water moved into the mouth of the river, poisoning the fertile farm lands on the Victorian coast. 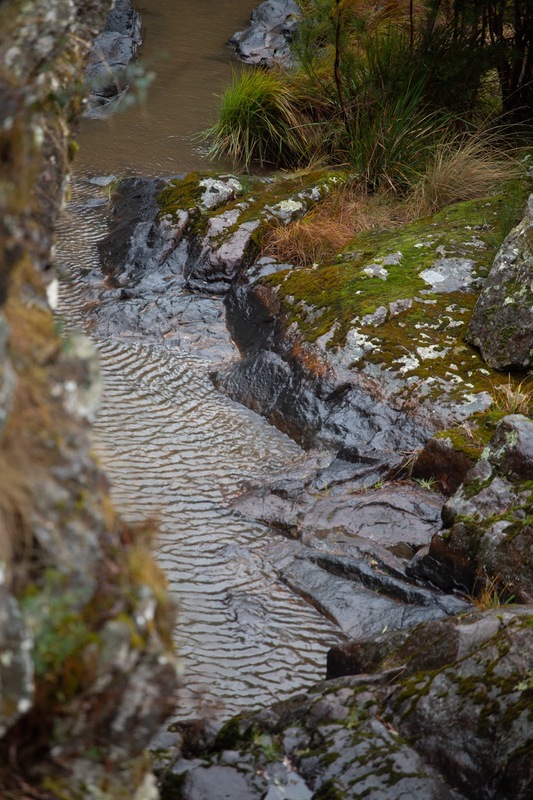 Recently, protests from rural areas finally have been heard, and some of the flow of the Snowy River has been restored. Back in January 1867, when the town was still called Buckleys Crossing, the river still ran deep and swift. 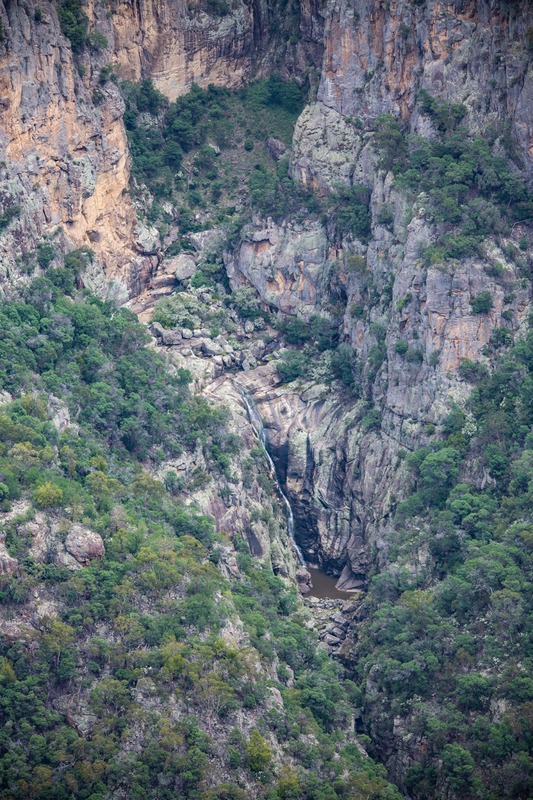 A place beyond the law – a pathway for stolen cattle into the South. There was an inn and a punt took travelers across the river. I sat by the river for a little while and thought about the Long Tailor, camped here, the night before his supposed death. Risking coming into the hotel, speaking to the barkeep, seeking directions to the South – into Gippsland. Topping up his flask with hard liquor and telling the barkeeper he was called “Jemmy the Warrigal”. Delegate had one last moment in the sun – it was unsuccessfully proposed as the location for the nation’s capital. The upper Snowy River has a number of pinches and rapids. 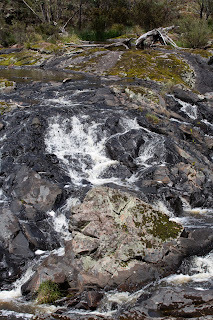 There are at least three named river falls along the upper reaches - more rapids or races than a traditional waterfall. Australians consider the Snowy River to be their iconic River, but the reasons for that have little to do with any real experience. Few people come here. 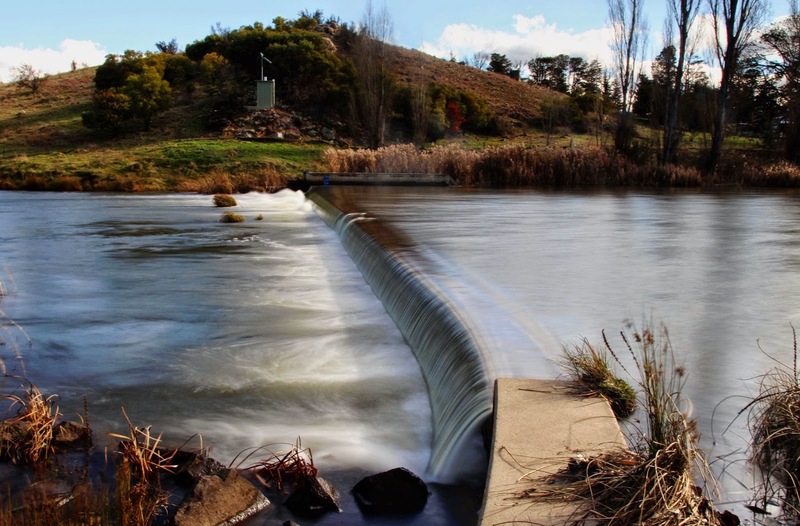 Hydro schemes cut the water flow to it to just 1% of annual flow. Recently, under great pressure, the flow has been returned to 10%. Still, apart from the time of the snow melt, it is just a shadow of its former self. But the roads in to this area are horrifying. The river and its tributaries drop drop 100-600m from the hills in the distance, but the falls are in remote locations. At first glance it might appear that their is reasonable access to the upper river - but that is an illusion. The roads that follow the upper reaches of the river are some of the most dangerous in the world. Even if you don't fall off the edge, you run the risk of a heart attack. 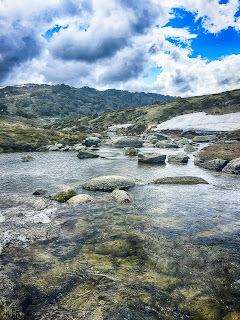 About 20 kms south of Australia's highest mainland mountain, Mt Kosciuszko, this creek has dropped a couple of hundred meters and is running with recent snow melt. This is about the first bit of flat ground the creek has seen. At the pinch point, a small bed of moss cushions the turbulence. A wide angle shot to catch upstream views and the sparse dry environment of the alpine region. 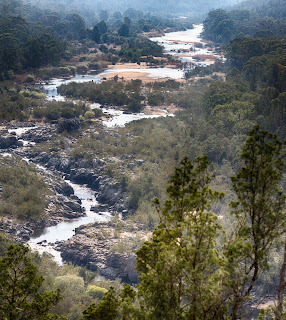 Along this part of the river there are numerous rapids and at least three smaller river falls but the views of the river valley are worthwhile by themselves. 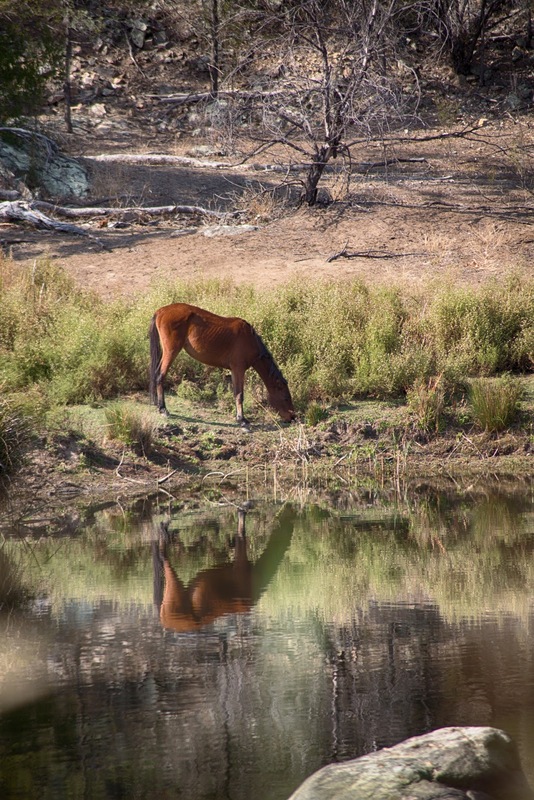 Wild ponies (brumbies) can be found throughout Australia's wilderness areas. It is a tough life. A few can be found foraging along the banks of the Snowy River near the Pinch River, but stallion mounds can be found at regular intervals along the edge of the river. Flowing with early snow melt, near Pinch Falls, the Snowy hits a rocky stretch. The moss banks underlying the upper cascades of these falls have been exposed by the dry conditions. 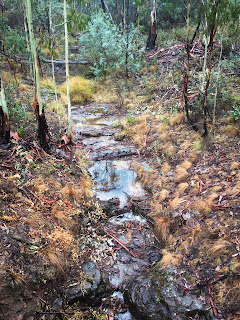 While the bush land nearby is tinder dry, the river bed remains humid. 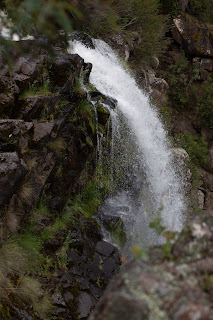 The cascades are the prelude to a challenging gorge and a number of high drop waterfalls downstream. 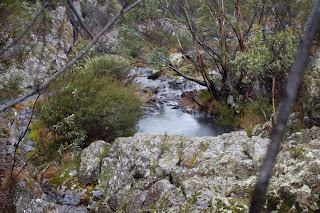 Little River, plunges down 600 meters over about 5kms to eventually reach the Snowy River north of Gelantipy. 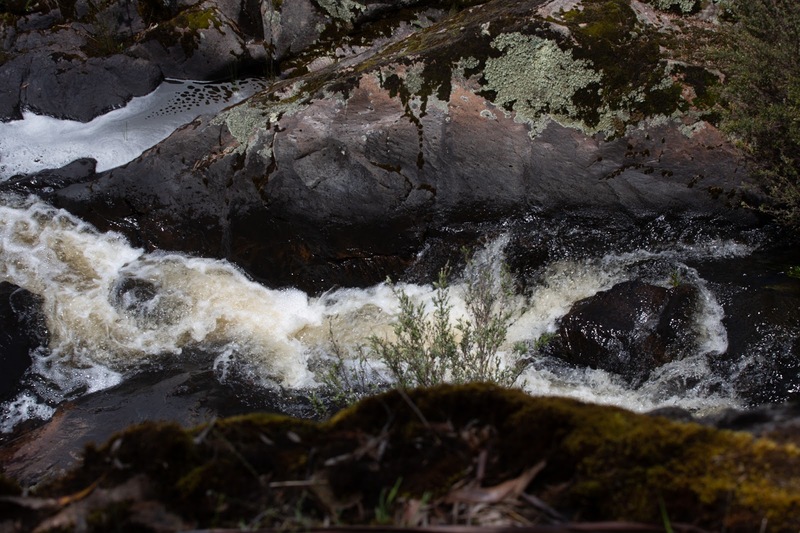 When heavy rain falls in the highlands, some of the most remote falls will flow - here a tributary of the Snowy River north of Gelantipy. 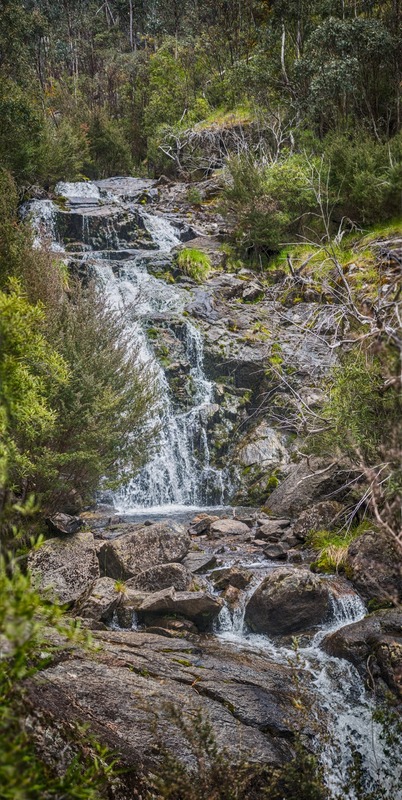 Taking its name from Mount Seldom Seen, this unexplored small creek is typical of the fractured Gippsland high country. 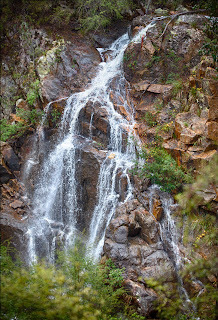 This creek cascades and falls unevenly in the high country, with larger falls on the slopes of the Mountain and down the escarpment to the NE of Gelantipy. The spiritual world of the First People is populated with distinctly Australian mythical creatures that differ from place to place. Today modern rural dwellers tend to lump them all together under the label 'Bunyip' and use it to scare kids away from dangerous places. The First People (the insular Kurnai) in this area divided the mythological world into three groups of beings. The first are the evil Narguns - stone beings that can detach themselves from the sides of mountains or emerge from holes in the ground. They drag travelers to their deaths underground. The second are the friendly Yabungs that live in trees and give friendly warning of things to come by the crack of a dry branch. Finally, there are the Mraats, pale colored (like the palm of a first person's hand - the color of death), who were thought to be spirits of the dead. When the Kurnai first saw pale colored Europeans (mainly Scottish colonialists) they took fright thinking that they were Mraats. You may never see a Nargun, Yabung or Mraat, but when alone in the bush you can feel their presence. 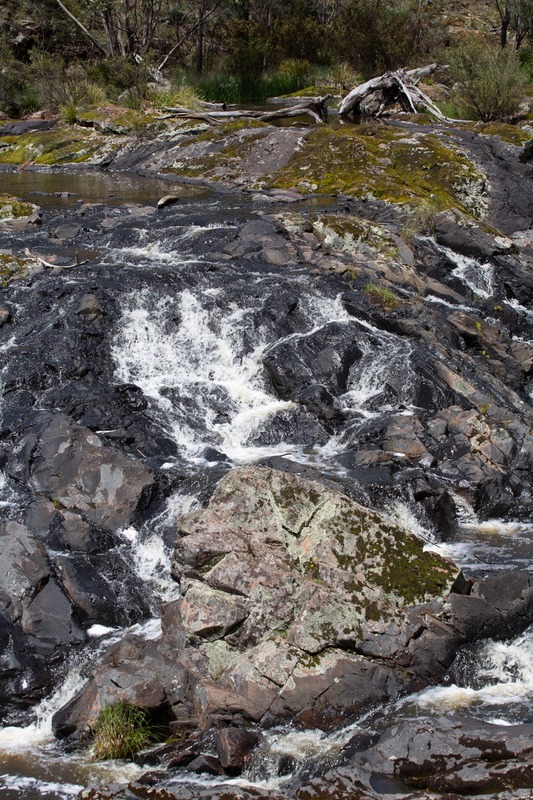 A 20m (60')+ stepped fall close to the Buchan-Gelantipy road. The flow eventually joins the Buchan River before meeting the Snowy River. This fall is not signposted, perhaps because parking on the road up the escarpment is very limited. Typical of many basalt falls in the region, this has developed a fan-like shape (which may have contributed to the strange name of the creek) and provides a gentle micro climate for mosses and ferns. 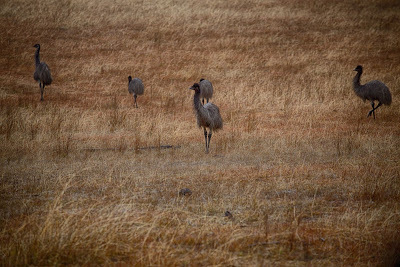 The small local community boasts a Buddhist retreat, eco villages and a cooperative, mixed in with older farming stations; all of which have had to survive fire and drought in the past decade. 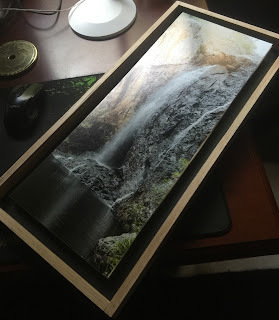 W-Tree Falls is poorly sign posted. Drive slowly when nearing the location (you will be travelling up a steep incline along a cliff, so be cautious) - you will see a small area where you can park a car together with some signs about Flora in the area.